I did it, I did it! I experienced my first sushi omakase and it was AMAZING. I have been waiting to give them a try when they first opened, but since it's an 3 hour or so drive from my place I was unable to visit sooner. Luckily after obsessing over sushi omakase's online, my boyfriend agreed to take me here for my birthday! I do not regret the I-4 traffic one bit now. 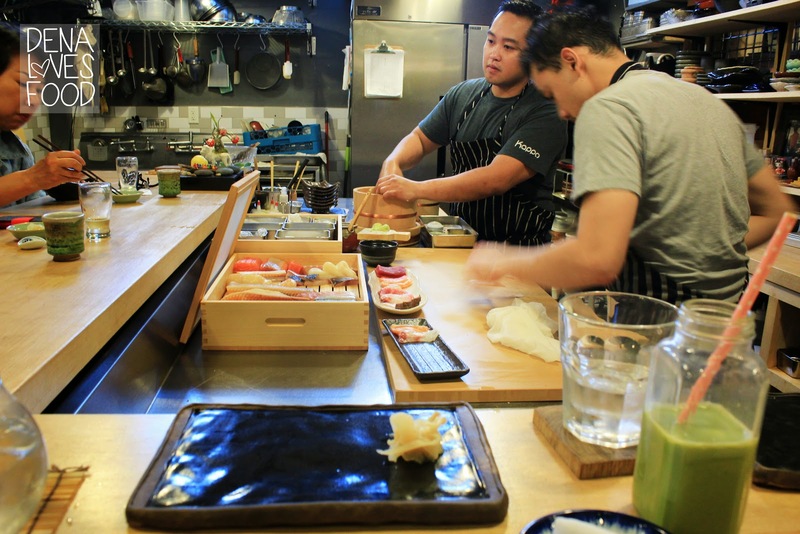 Kappo is one of the few stalls located in a building called East End Market. I love the concept and also love the atmosphere. I wasn't expecting it though, I knew Kappo only seated 7 people at a time, but certainly did not expect it to be this tiny. One step out of the stall's curtains and you're next door to a Juicing stall or maybe even over to the Cheese stall. The size certainly does not affect the quality of service though, it made it even better. 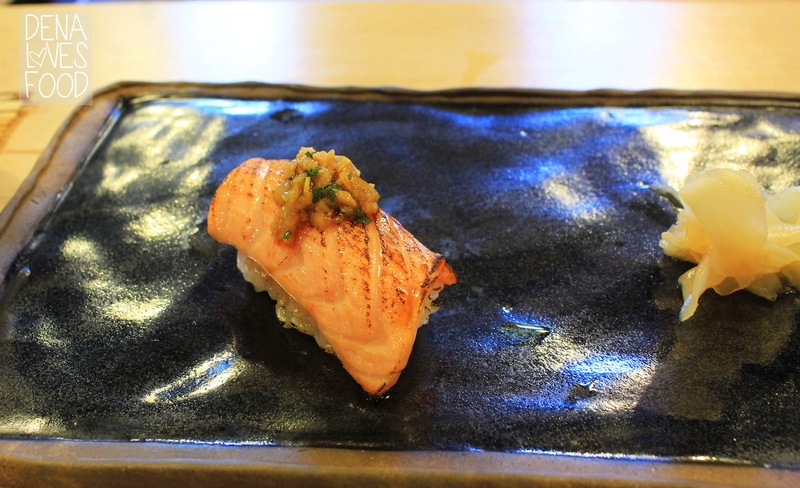 Kappo provides a new menu that is changing constantly due to their inventory. This just means fresh quality stuff all the time! We only had to wait about 30 minutes when we arrived, which was perfect. I was able to browse the other stores and take a few pictures. Happy, Happy, Happy birthday to me! Once we sat down I knew instantly what we were going to order. 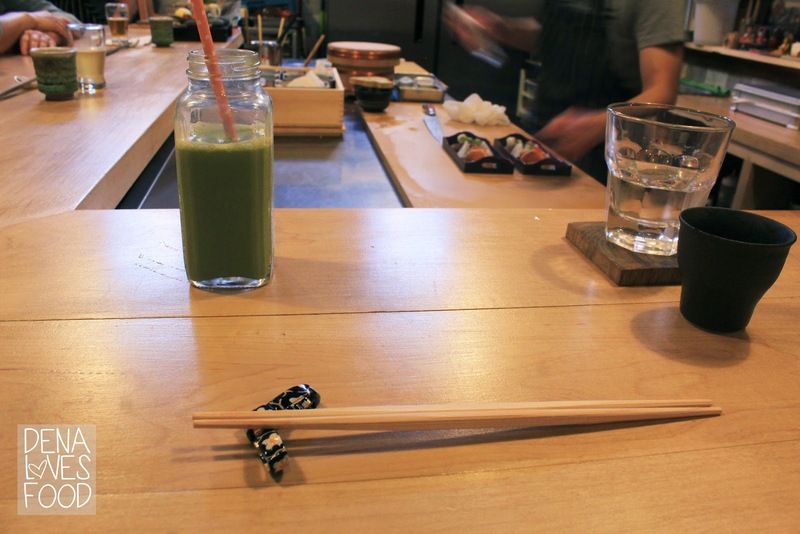 The sushi omakase and I was super happy to start my Magical Mystery Tour with Kappo. We first got started with the roasted tea which is a thumbs up, I love the roasted nutty taste of all toasted teas. 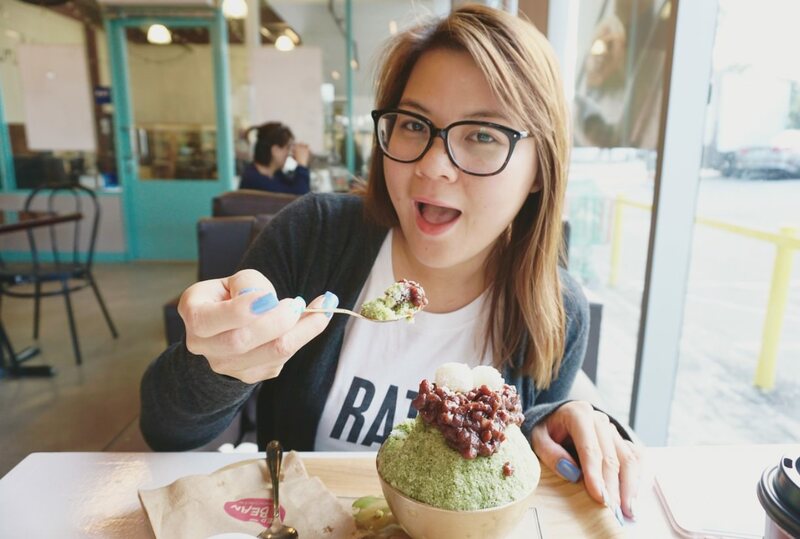 We also tried their Matcha tea with soy and whole milk. I prefer the soy, and the boyfriend prefers the whole milk. Both are super delicious and comes in adorable milk jugs. I'm already loving it and am too excited to focus on anything at this time. I'm just patiently watching everything and drooling. Let's start the Magical Mystery Tour! **I'm going to try my best to describe, but I was too busy gobbling down to know what fish is what. Just enjoy the beautiful photos and wipe the drool from your face after each photo, I know I will. 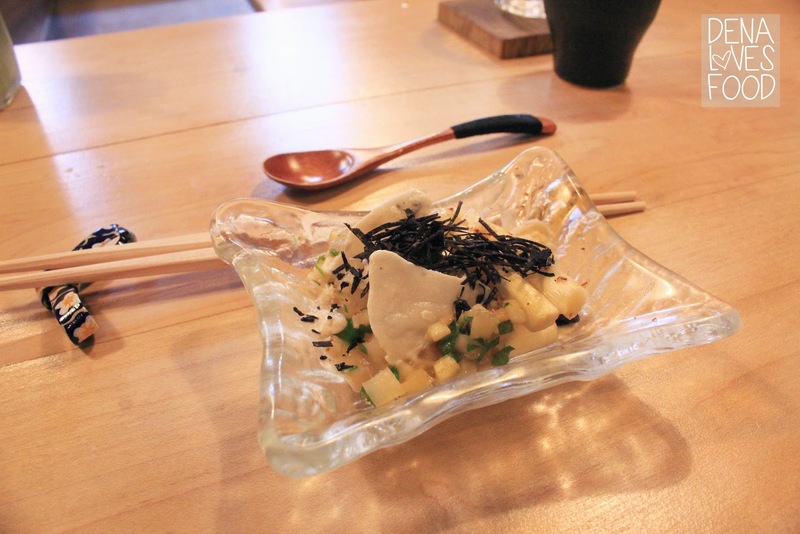 We started the omakase with this interesting dish. It's veggies with truffles and an ice.... sauce? I know there are fancy words and techniques, but I just don't remember it. It's really refreshing, yet the ice sauce that was shaved in this dish was creamy and super flavorful. Yay! 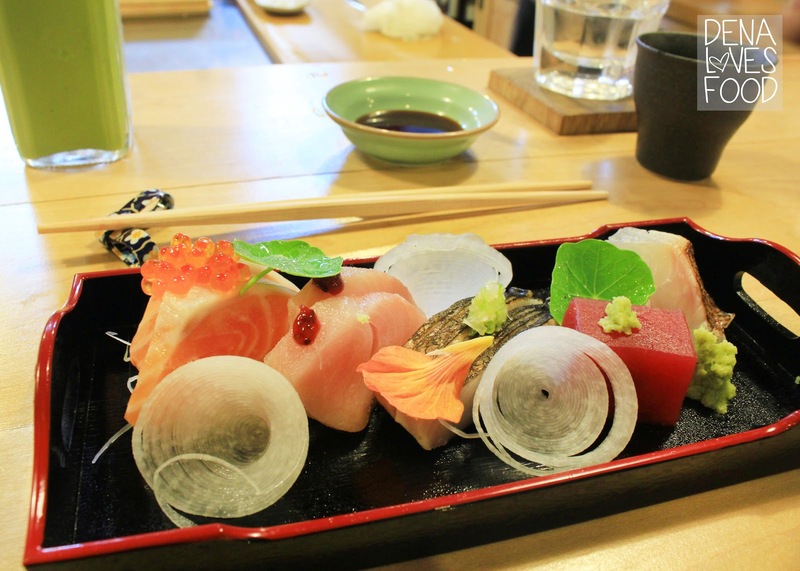 Sashimi is my all time favorite. This beautiful plating was just too pretty to eat, but once I started I couldn't put my chopsticks down. The fresh wasabi was also the first for me and I'm in love. It's not as potent as the mixed/fake wasabi. It's light, refreshing and also very smooth going down. So many firsts! 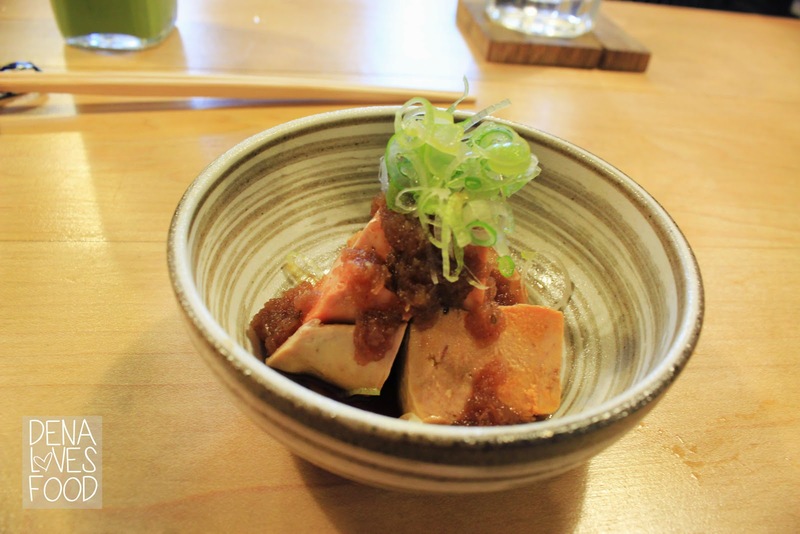 This is a Monkfish Liver dish with a type of tangy dressing on it. I'm not going to say what because I don't want to be wrong... maybe plum? Hmm.. anyways it was also amazing. 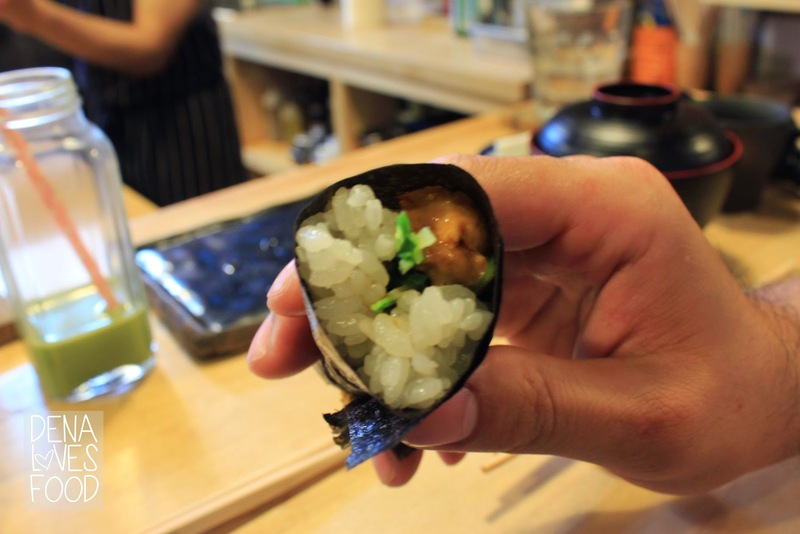 I've only seen monkfish liver on the menu at higher end sushi restaurants, but have not actually tried it. Well, I can say I have now and love it. It really is the foie gras of the sea, it's super buttery, rich and smooth. The tangy dressing helps cut down the creaminess for more effective eating. I'll always order monkfish liver from now on! My boyfriend also really loves it and he's not much of a liver guy. Now we're off to the sushi omakase, which is the choice of the chef. I'm not picky at all so I'm all for it. I can't promise you I know what fish is what, but I do know this. I'll eat it all over and over again. They were all delicious! There's a lot of care that goes into this, as the chef individually creates each piece for you. Mmmm, I'm drooling again. Our first beautiful piece. 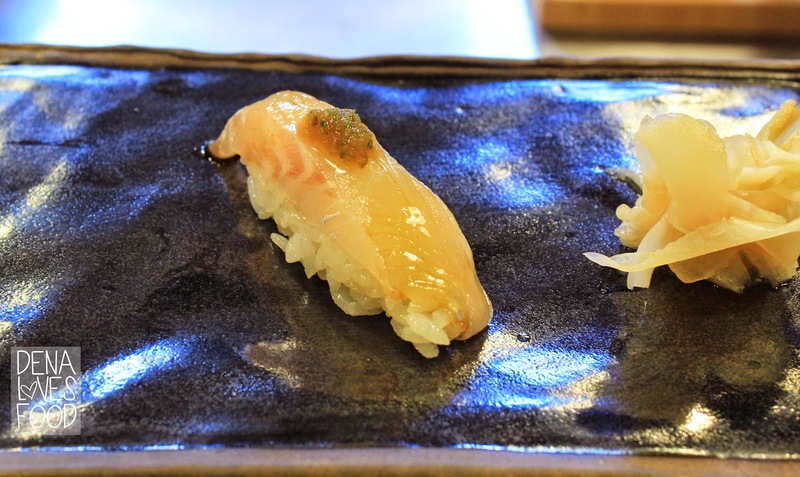 Each piece is made and seasoned perfectly so there's no need for soy sauce (the chef will lightly sauce it for you). There's also no need for chopsticks, just your fingers. Oooh, look at that sauce dancing between the threads of the fish. My boyfriend liked this! It's an cousin of salmon, but I don't remember the name. 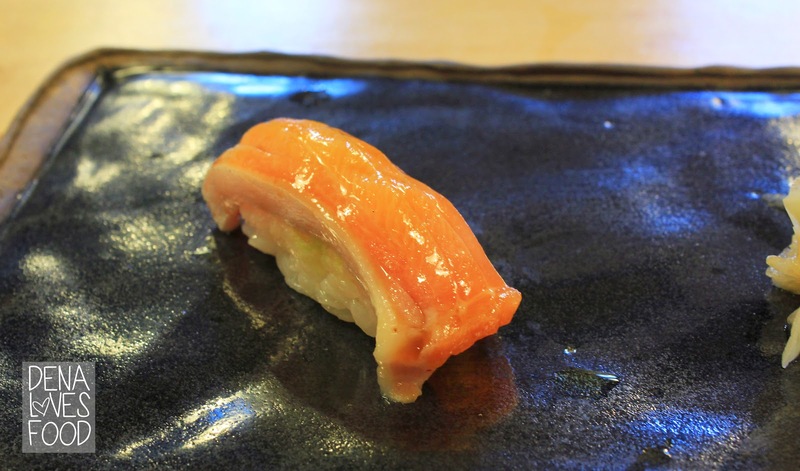 It is indeed very similar to salmon. One of my favorite piece, this beautiful torched salmon topped with almond mixture of something.. and almond oil. It just melts in your mouth and the flavor was on point. I absolutely love how red this tuna is. It's so bright and delicious. 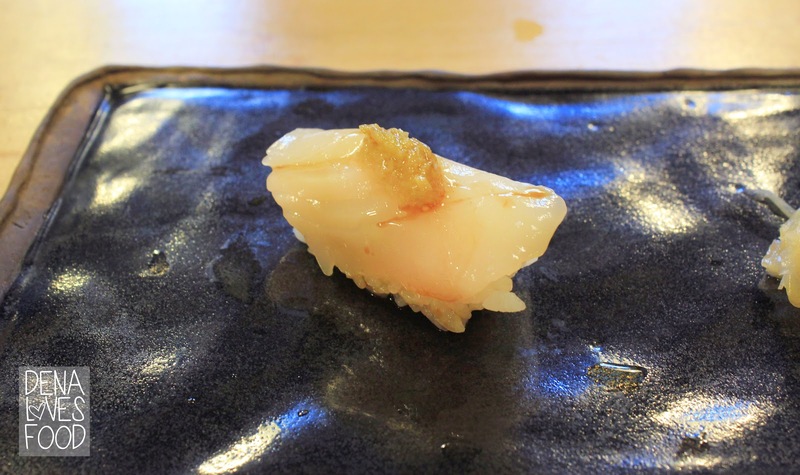 I got excited when I saw raw scallop getting pulled out. My boyfriend loves scallop, unfortunately he wasn't crazy for this piece. He said it just melted in his mouth and wasn't expecting that. I also agree it was my least favorite bite, but don't get us wrong, it was still good! This is my first toro tuna! It's the belly of the tuna and is supposed to melt in your mouth. It's a beautiful piece and I was really excited to try it. I can't say that I love it, but I really enjoyed it. Maybe a few more pieces in and I'll tell you then. My ALL time favorite! I love uni and I just can't handle myself when I get into contact. This sea urchin was from Maine and it's so sweet and creamy. I wish I could have 10 more pieces. 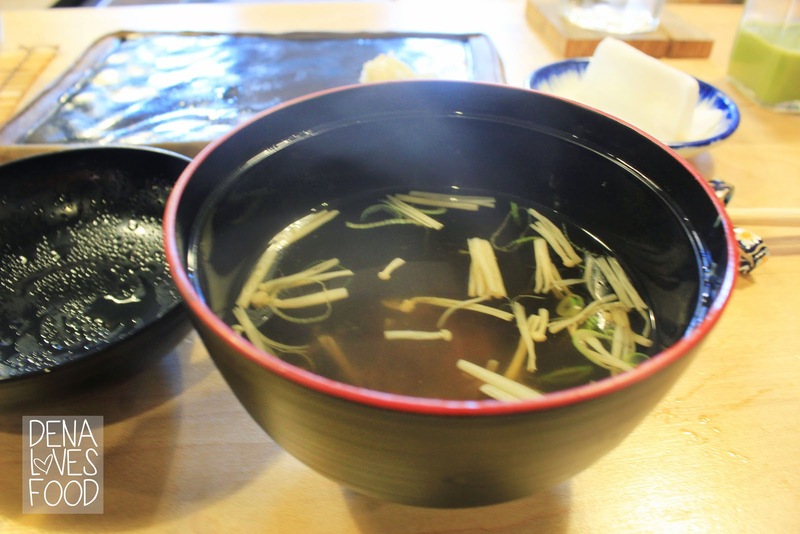 We received a bowl of dashi broth to wash down the food. It's simple, clean and delicious. 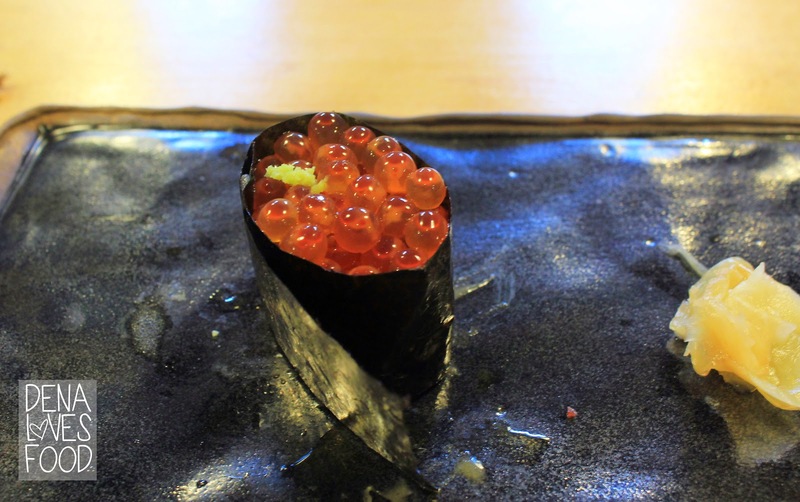 I haven't started to enjoy eating Ikura (Salmon Roe) until maybe 2 years ago. 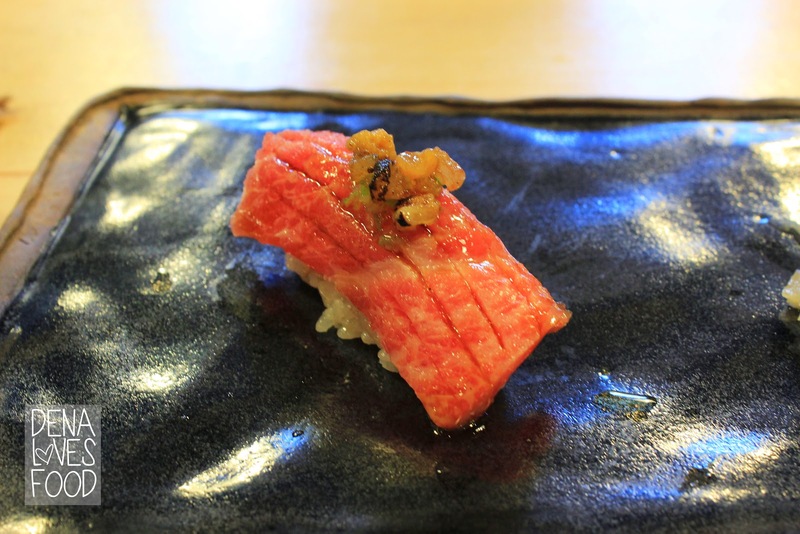 This bite from Kappo might be the best one ever. It's seasoned in a very citrus so each burst is full of flavor. It's also not overly salty or soft. Perfect and fun to eat. The last sushi on our tour is the uni handroll. 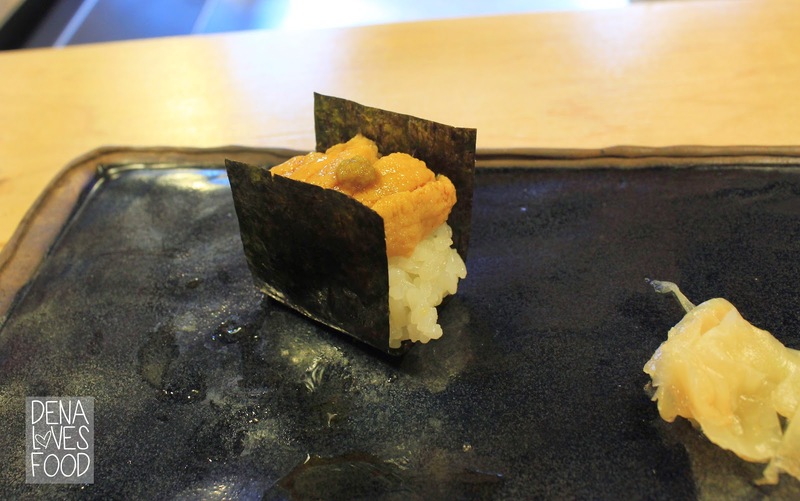 It's full of uni and a shiso leaf which compliments the richness of the uni with an hit of earthiness. 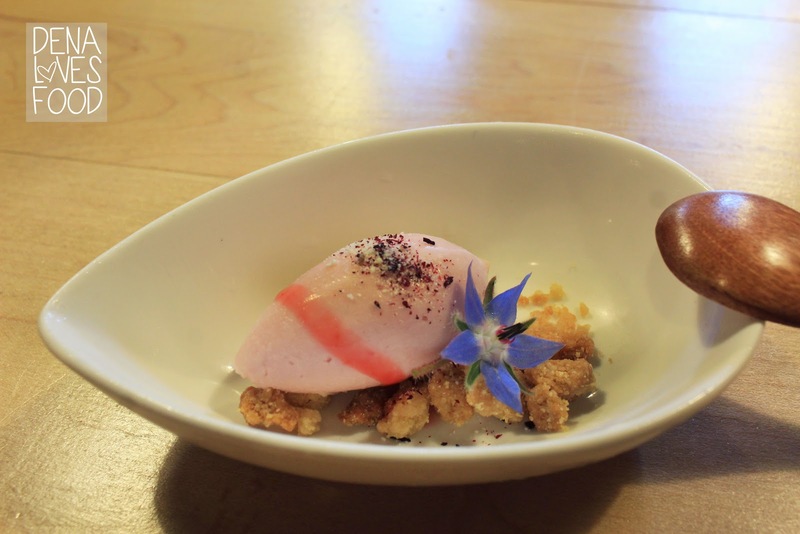 The final stop of our Magical Mystery Tour is a scoop of Sakura or Cherry Blossom ice cream with almond crunch. I'm not crazy for cherry blossom flavors, but this was really tasty, the salt I believe sprinkled on top brings out the sweetness of the ice cream and the almond crunch gives it great texture. Overall, I would want to live in Kappo and each here everyday, multiple times a day. I am in love with them! 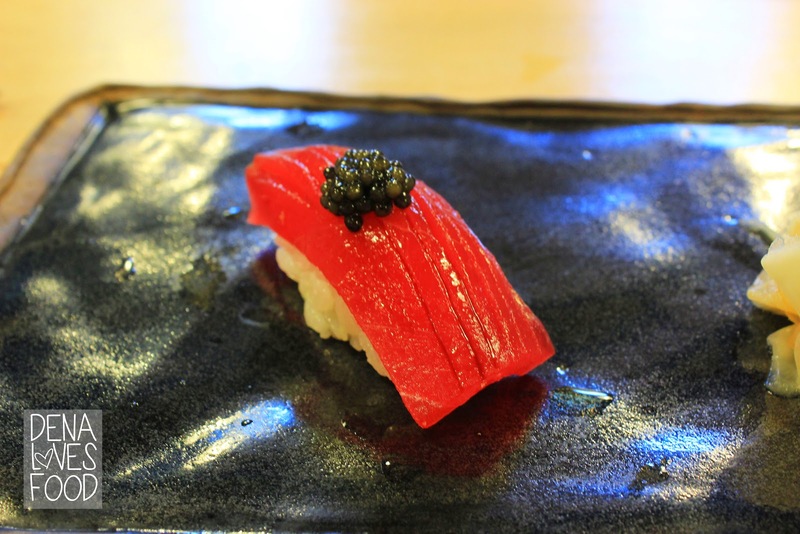 It was a beautiful Sushi Omakase lunch for my birthday and they certainly do make you feel special. I even received a shot! The service is really on point and personal (on a good level). 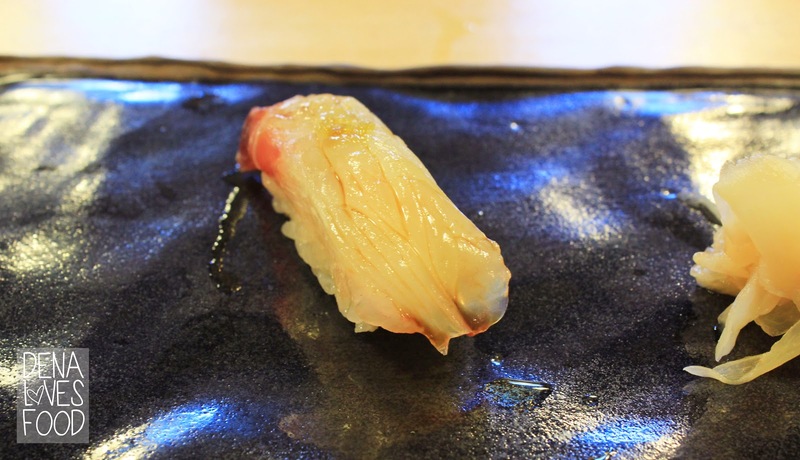 I totally recommend trying out Kappo or even a sushi omakase once in your life. It's so delicious I want to go back now! !